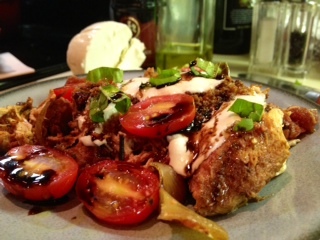 Recently I came across a recipe that I had printed for Balsamic Chicken which was cooked in the slow cooker. It sounded delicious and very easy-but why stop there? 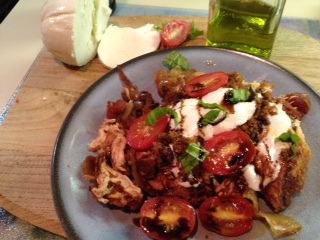 If the chicken would cook for hours in delicious balsamic vinegar why not make it into a caprese chicken dish? In my head I imagined a piece of chicken topped with a slice of melted fresh mozzarella cheese, some toasted breadcrumbs, some tomatoes, fresh basil and drizzled with olive oil and balsamic glaze. And that’s exactly what happened-although the picture in my head was this neat little package all perfectly balanced on the plate and the plate that I ended up with wasn’t quite so neat. The flavor. WOW! Delicious! Drizzling the balsamic glaze and olive oil over the dish at the end really made all of the other flavors pop. The other fab part of this dish is that the chicken cooks in the slow cooker and you can make that in advance (mine was cooked on Sunday and I made the completed dish on a Tuesday night). The completed dish took no more than 15 minutes start to finish-so it’s great for a weeknight as well. I had cherry tomatoes on hand but you can certainly use other larger tomatoes and just cut a few slices-just make sure they’re nice and ripe. 1/2 pint cherry tomatoes, sliced in half or larger tomatoes sliced. Trim any fat from the chicken, season with salt and pepper and set aside. Coat the bottom of the slow cooker insert with the olive oil, snuggle the chicken breasts into the cooker in an even layer, top with the onion and, garlic and herbs. Pour the vinegar and tomatoes into the cooker. If you plan on completing the dish another day allow the chicken and onion/tomato mixture to cool and then store in the refrigerator for a few days—otherwise continue below. Preheat broiler to low setting. Place the butter in a small pan on the stove over medium heat. When hot and bubbling add the breadcrumbs. Stir and cook until toasty brown then set aside. Reheat chicken and some of the onions/tomato mixture (however you’d like–I used the microwave). 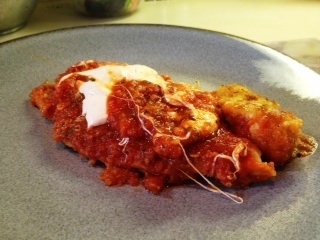 In a dish suitable for the broiler place the chicken and some of the onions/tomato mixture, top with slices of cheese then breadcrumbs and put in the oven until the cheese is melted and bubbly. Remove from the oven, place chicken and some of the onions/tomatoes on a plate, arrange tomatoes around it, sprinkle with basil and drizzle with the olive oil and balsamic glaze. Serve immediately. Here’s an easy and really tasty weeknight meal that you can have on the table in about 30 minutes. The chicken coating is crunchy and delicious, the cheese is deliciously stringy and melted and the sauce is whatever you want it to be-home made or jarred-it’s up to you. I prefer home-made but since I was out I used some jarred sauce. I like having them in the pantry to use in a pinch. I opted to forego the pasta that’s usually served with this and just have some steamed veggies and a salad with it. I didn’t miss the pasta. 1-1.5 lb boneless skinless chicken breasts, trimmed of fat and cut and/or pounded to equal thin pieces about 1/2 inch thick. Place flour in one shallow bowl, the eggs in a 2nd and the panko in a 3rd and place the bowls next to each other. Season the flour and panko with salt, pepper and italian seasoning. Heat 2 tbsp olive oil in a non-stick skillet (large enough to hold the chicken in 1 layer or almost all in one layer-a little overlapping is ok) over medium/high heat. Take 1 piece of chicken, roll it around in the seasoned flour to coat it, shake off the excess, dredge through egg then roll in the panko to coat. Place in the pan and cook until first side is browned and crispy, then flip it over and do the same for the other side until it’s cooked through thoroughly. Set aside and keep warm. Repeat with each piece of chicken. You may place more than one piece in the pan but do not crowd it. Pour the sauce into the same pan and set over medium/low heat until thoroughly heated then place the pieces of chicken back in, ladle some of the sauce over the top of the chicken and then top the chicken with mozzarella and either cover with a lid and leave it on the stove until the cheese is melted or place in the oven (if you have an oven-safe pan) until cheese is melted. You may also serve over pasta or then put the chicken into a hero roll for a great sandwich. One of my great loves is fresh mozzarella cheese. I have a store by me that makes it by hand every morning and, if I stop in on the way to work, when I buy it it’s still warm. Yummy!!! 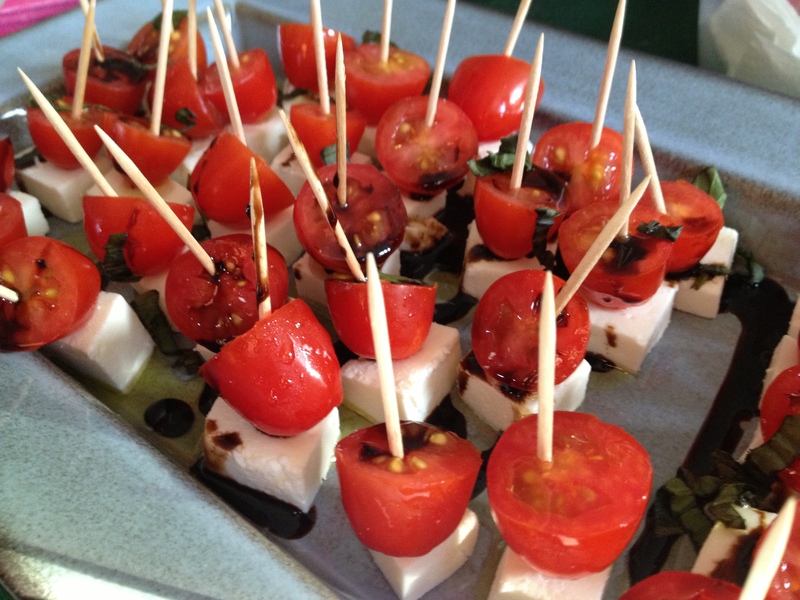 To me that delicious cheese, really sweet ripe tomatoes, balsamic glaze, olive oil and basil make one of the most perfect combinations known to woman (and man too!). These small one-bite sizes are perfect for appetizers for parties etc… and because the balsamic glaze is thick it doesn’t drip like the plan balsamic vinegar. This platter is such a snap to put together. I often bring it to other places and just assemble it there. Cut up the cheese and tomatoes as instructed below, put olive oil in one small container (or ziplock baggie) and do the same with the balsamic glaze. Tote along some basil and toothpicks and a small platter and off you go. Easy peasy. I brought this to my Mom’s for Thanksgiving along with the Loaded Potato Bites and Kalamata Olive and Tomato Crostini. Take the mozzarella ball and cut off the rounded sides so that you are left with a square or rectangle that will easily be cut into cubes (eat the rounded pieces that you cut off:). Cut the remaining cube of cheese into small 1/2×1/2 inch cubes. Cut each tomato in half the short way. With a toothpick spear a piece of the tomato then the mozzarella. Repeat with remaining cheese and tomatoes and place them on the platter. Sprinkle with the basil and then the olive oil and balsamic glaze. Tips: if you are prepping the cheese and tomatoes at home you can put the cubed cheese in an airtight container for a day or 2. For the tomatoes keep the pint container, rinse it out, and when you have the tomatoes halved put them back into the pint container. Place a folded paper towel in a small plastic container in which the pint container can fit into. This will keep the tomatoes from getting soggy and if juices come out the paper towel will absorb them. I don’t suggest keeping the pre-cut tomatoes around too long-a few hours at the most.